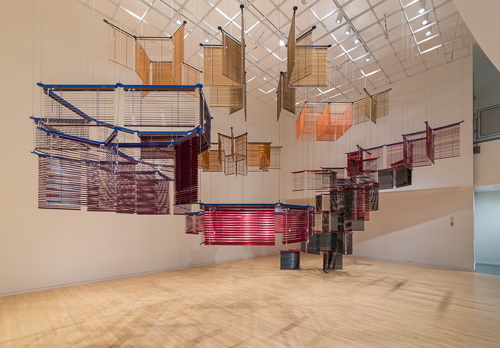 In this solo exhibition at the Henry, Haegue Yang takes over the museum’s East Gallery to present Towers on String (2012) and Field of Teleportation (2011). 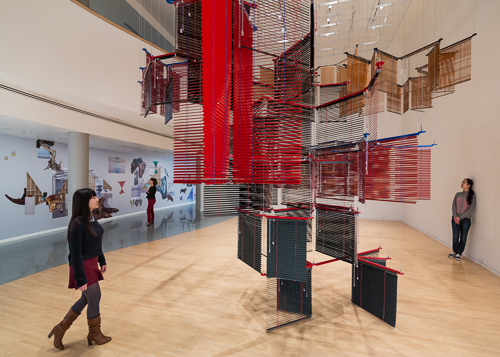 Constructed with custom-made Venetian blinds, towers will hang from the ceiling, creating transparent volumes of color that articulate the gallery space. The abstract sculptures are composed of identical flat planes placed at mirroring or diverging angles, creating structures that respond to internal geometries while also appearing to grow organically from their axis, radiating outwardly or upwardly in stacks of open forms suggesting rhythm and movement. Towers on String is presented in dialogue with a digital wallpaper made in collaboration with Berlin-based graphic designer Manuel Raeder. 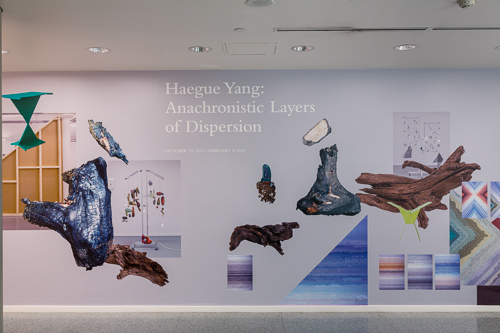 In Field of Teleportation, Yang reproduces some of her key works and views of past exhibitions. 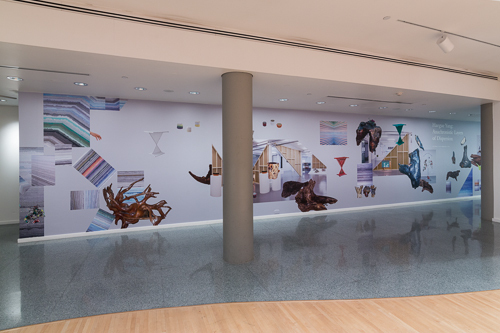 The three-dimensional works are flattened through the photographic process to inhabit a supernatural space devoid of gravity, becoming a non-hierarchical, quasi-archive of her production to date. Yang was born in Seoul, South Korea in 1971 and lives both in Seoul and Berlin, Germany. She has exhibited her works in international institutions, including Museum of Contemporary Art, Strasbourg, France; The Institute of Contemporary Art, Boston; Tate Modern, London; and the New Museum, New York, among others. In addition to her exhibition at the Henry, her work is currently being shown internationally at the Bergen Kunsthall in Bergen, Norway and the Glasgow Sculpture Studios in Glasgow, Scotland.